Do You Remember 'Loving' Magazine? If you were a teenager in the 70s you probably do. if not, you'll think this is just quaint! 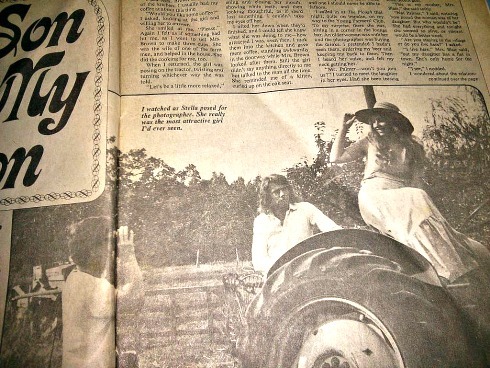 The photo above (apologies for poor quality) is a clipping from Loving Magazine, 1975, and that’s me on the tractor! It was my ‘gap year’ pre University, although it wasn’t called a gap year then. My Mum had carefully saved the clipping and we found it neatly folded with some old birthday cards. Well done, Mum! I was in a story which ran over two editions, and I got paid £25 which seemed like a lot of money at the time. It came about because I had a friend whose Mum was features editor on the magazine. They used to illustrate the stories with photos and she saw me in my long Laura Ashley frock and asked me if I’d do a photo shoot for them. Having established it was all in ‘good taste’ I happily agreed! I re-read the original story: what was much stranger, was that even in 1975, the girl had a career. OK it was modelling but she was an independent woman and not exactly stick thin, and in charge of her own destiny. In order to get the girl the boy had to accept her career. This was the same era when sexism was rife and beauty pageants were a regular feature on our TV screens. I never realised that Loving Magazine was so ahead of its time but then to be honest, I never actually read it regularly. Fortunately we don’t have beauty pageants on screen any more (thank you to all those feminist demonstrators), but in many ways, it feels we haven’t moved that far. If that picture went out today I’d be photo shopped so much that I probably wouldn’t recognise my 19 year old self. PS I’d like to attribute the picture but can’t. It was a photographer for Loving Magazine in 1975, that’s all I know. If you know anything about it, please do get in touch! RenewYou is my inspirational day for women, licensed to women across the world. More information here. Hi, I’m Jane C Woods and I have an absolute passion for helping women achieve success in their lives. Be it the glass ceiling, the crystal maze, or very personal issues, I’m all about helping women achieve to their full potential and live the way they want to without being carbon copies of men. But I’m not about putting men down in order for women to get ahead, there’s plenty of room; I just want the guys to shifty up a bit… If my face looks familiar it's because I love Psychologies magazine (I've been buying it since the very first issue, such a good resource) and it's the only place I choose to advertise my courses. I write on women’s issues on my blog, www.changingpeople.co.uk, and am regularly featured in magazines, and on radio, but I’m probably best known for RenewYou. RenewYou is my one day personal development course for women. We have an international network of experienced, specialist women licensed to deliver it and empower women across the globe. Our goal is to reach one million women. It’s a big goal but… In 2013 we started with a single RenewYou specialist, me. Now you can find a RenewYou Courses across the UK, in the USA, Canada, Greece, Bangkok, Pakistan, South Africa, Belgium, with new countries being added all the time. My dream was to create a thriving and caring business on ethical, and dare I say, feminine terms, with a real community spirit of help and encouragement. And it’s actually happening with the support, expertise, and enthusiasm of my wonderful trainers. I think, (apart from my two lovely kids, a daughter and a son) that it’s probably my proudest achievement to date. Wonderful Changing People Women: One of the joys and privileges of my work is that I’ve connected with some really inspirational and wonderful women – from politics to entertainment to academia. They include: TV presenter, house fixer and matchmaker Sarah Beeny Amazing entrepreneur Sam Roddick of Coco de Mer Outspoken and entertaining academic Mary Beard Politicians like Siobhan Benita and Natalie Bennett Ex BBC broadcaster Miriam O’Reilly who bravely took on the might of the BBC- and triumphed A very rare interview with Sarah Montague, of the influential BBC Radio 4 Today programme I hope you like the posts and I hope they are helpful. Live life to the max and never hide your light under any bushels!